The auto shipping industry has many moving parts. We have solutions for all of them. ProABD provides you with the tools to take your business to the next level. ProABD enables you to control every aspect of your auto shipping business in an effortless and seamless manner. Run your business anytime, anywhere. ProABD is a comprehensive customer relations management (CRM) software for the auto transport industry, specifically for auto transport brokers. ProABD is the culmination of upwards of 20 years of experience in the auto shipping world. Every aspect of the auto transport brokerage business has been taken into account, streamlined and improved with ProABD. From lead management and automated quoting to credit card charging and detailed reports, ProABD has everything you need to run your business effectively. Automatically price and respond to incoming leads and have ultimate control over lead assignment. 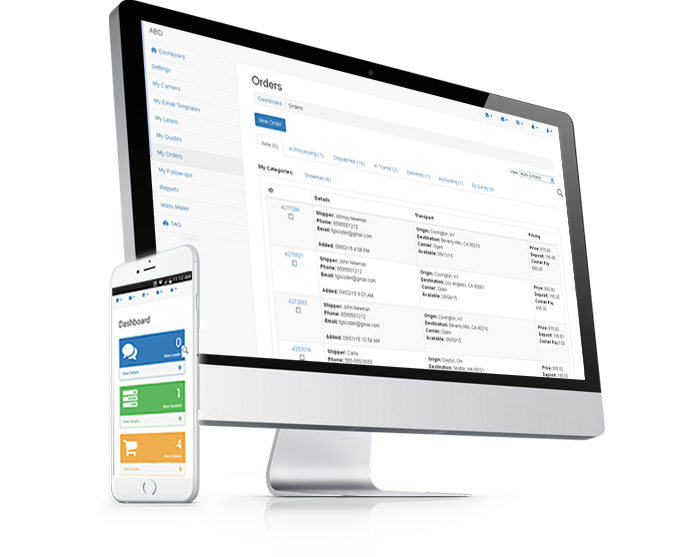 Provide your customers the convenience of placing their order quickly and securely online. Easily post your loads to the top load boards in the industry! Control every aspect of your business. A one-stop resource for your auto transport brokerage. Automatically send quotes, follow-ups and status emails for maximum convenience. ProABD is fully integrated with TAQ. Instantly and accurately price your leads. Charge your customer's credit card instantly and securely thanks to our Authorize.Net gateway. We have integrations with many of the major load boards in the industry. Give your customers the convenience of placing their orders online, 24/7. Please call us at 800-235-9853 for more information about pricing! We want to hear from you! Contact us today for a demo of ProABD. Let the changes in your business begin today!